The 2015 MLB draft begins today. Allow us to help you prepare accordingly with some help from the Socratic method. So what’s up with the draft? That’s a big question. We could start with how it’s a way for major league teams to enrich themselves at the expense of amateur players by (1) taking away their leverage to negotiate with all 30 franchises, as free agents can, and (2) imposing artificial spending caps to depress salaries. Yeah, but what if, for once in your life, you concentrate on the on-field stuff instead of zooming out and being outraged at economic injustice? Just as long as we acknowledge up front that this whole process is gross and should make your stomach turn whether you’re a pro-labor lefty or a laissez-faire free-market Randian. Whatever you want, man. You covered a lot of the big shortstop prospects, as well as a few would-be first-round pitchers, in last week’s prospect primer. Is there any other potential franchise-changing player we should know about? Well, not really. Every so often there’s a draft, like 2005 or 2011, in which there are multiple future MVP candidates. But that doesn’t look like the case this year. There are some risky high school stars, like Texas outfielder Trenton Clark and Georgia catcher Tyler Stephenson, but they carry the downside of taking longer to develop and having the potential to miss entirely. I think this draft’s greatest strength is its solid, quick-to-the-majors college talent: shortstops Dansby Swanson and Alex Bregman, pitchers Carson Fulmer and Tyler Jay, and polished hitters like Florida State left fielder D.J. Stewart and Cincinnati outfielder Ian Happ. I wouldn’t pick any one player in this draft to have a 40-win MLB career, but teams will be able to select likely major league contributors on both sides of the ball well into the 20s. So if this draft is going to produce a bunch of guys who are quick to the majors, who’s going to get there first? It’s almost always a college pitcher, and there are a couple of candidates in this crop. The first scenario is that either Jay or Fulmer falls to eighth to the White Sox, who were very aggressive with previous first-round picks Carlos Rodon and Chris Sale, bringing both up in a bullpen role within a year of the draft before switching them to the rotation. Neither Jay nor Fulmer has long to go before being able to get big league hitters out routinely, so either could have a Brandon Finnegan–style cameo before returning to the rotation if things break right. The other option is Dallas Baptist right-hander Brandon Koch, a 6-foot-1 reliever with mid-to-upper 90s heat and a slider that does bad things to bad people. Koch’s ceiling is as a very good Craig Kimbrel cover band, and he could become that relatively quickly after going, most likely, early on Day 2. Does the lack of high-upside top prospects mean anything for draft strategy? The abundance of safer prospects, the rash of injuries to the draft’s top pitchers, and the lack of too-good-not-to-take stars at the top of the draft leaves open the possibility of first-round teams getting cute with their bonus money. With finite money to dispense, a team can spend $2 million on Player A, or it can spend $1 million on Player B, who’s 90 percent as good, and then free up the other $1 million to throw at someone who’s more talented but has dropped due to signability concerns. Last year, the consensus top six prospects went in the first seven picks (and the one surprise, Indiana catcher Kyle Schwarber, is certainly not giving the Cubs any reason to complain). I’d be absolutely shocked if something like that happened this year, and if a team can save some cash on a lesser talent early, there will be gifted players to throw it at later. 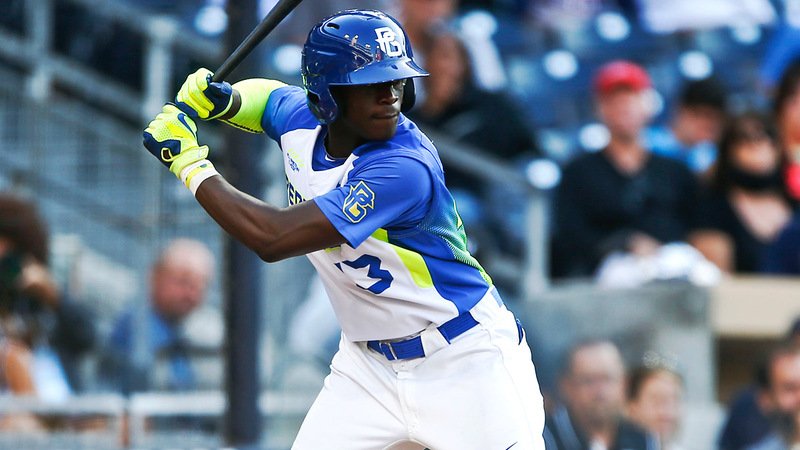 In his latest mock draft, Keith Law has Daz Cameron, who’s probably a top-10 pick on talent alone, dropping out of the first round because of bonus demands, while California prep lefty Justin Hooper tweeted Saturday that he is 100 percent going to UCLA in the fall, so teams shouldn’t bother picking him. Sometimes, a player actually does want to go to college really badly, but often as not, statements like that are meant as a negotiating tactic, with the player daring a team to throw so much money at him that he’ll put college on hold. In the past three drafts, we’ve seen Lucas Giolito, Brady Aiken, and Jacob Nix — just to name pitchers who swore they’d go to UCLA if they didn’t get a high enough signing bonus — play hardball, and none of them ever put on a Bruins uniform. Maybe Hooper goes to school, or maybe a team that likes him and has money to burn offers him a huge bonus not to. We shall see. Last year, the Cubs were the domino, with their Schwarber pick setting a whole bunch of other dominoes in motion. Who’s that team this year? The smart money is on the Diamondbacks taking Swanson first, but the Astros, who have two picks in the top five and are known for playing bonus-pool games, have a ton of options. If they take Bregman, the Rockies, who supposedly want a college pitcher, might not be able to pass on high school shortstop Brendan Rodgers at no. 3, which would kick the top five college pitchers — Jay, Fulmer, Dillon Tate, Walker Buehler, and Jon Harris — down the board. Maybe Jay, who’s from outside of Chicago, goes to one of his hometown teams in that scenario. But there are a few fairly distinct draft patterns in play, and they all diverge on what Houston does at no. 2 overall. So apart from the obvious guys, who do you like? There are two likely first-round guys on whom I’m much higher than most people are, as well as a couple of others who will probably go on the draft’s second day. I’m not a trained scout, so take what follows with whatever caution you think is necessary. But I was really high on Schwarber last year, and he’s been good so far, so I’m going to take some heat-check shots. First: Missouri State righty Harris. He’s an athletic 6-foot-4, 190 pounds, with some room to fill out physically. He’s got a low-90s fastball and a power curve, and though I might be the only one who thinks this, I’d at least consider taking him over Fulmer. I saw him in a tiny ballpark with the wind blowing out, against a Dallas Baptist lineup that does nothing but hit for power, and he absolutely mutilated them. On the other hand, I might just be high on him because the one time I saw him in person he pitched what might have been the best game of his life, and Arkansas just torched him on Friday, so there’s a very real chance I could be very wrong. Second: Happ, a near-mirror-image switch-hitter who could play second base at the next level. I talk about the second base archetype a lot: college guys who are usually (though not always) about 6-foot, 200 pounds, with good but not exceptional athleticism, who play an infield spot, get on base, hit for a little power, and steal bases at a high rate of success. Chase Utley’s an elite example of this, with Cody Asche a poor man’s version, and Jed Lowrie, Dustin Pedroia, Ian Kinsler, Jason Kipnis, and a few others are in between — they’re players of the same species, if not the same quality. Happ is a guy like that. (So is Bregman, but I don’t have to convince anyone about him.) Happ is a legitimate switch-hitter, which is rarer than you might think, and he doesn’t have any weaknesses in his game. He also talks about hitting more intelligently than any college position player I spoke to this year, and in February, I saw him misread a pitch, adjust mid-swing, and hit it out anyway. He’s going to go in the late teens, and if a team is at all convinced that he can play second base in the majors, he should go 10 spots higher; a similar player, Michael Conforto, went no. 10 overall in a better draft last year. Third: Illinois catcher Jason Goldstein. This is something of an irrational hunch. Goldstein crushed Big Ten pitching this year while hitting cleanup for an excellent Illinois offense, but he doesn’t have great athleticism or a great arm. He is, however, a good receiver and great handler of pitchers, which you can tell because, unlike most college catchers, he calls his own game. So much of catcher defense is mental: concentration during the game and a willingness to work off it. Goldstein, according to his teammates and coaches, operates on a higher intellectual plane than most ballplayers. I’ll bet on the makeup, and if he doesn’t become a big league catcher, he’ll become a big league coach, or a cabinet secretary or something. Like I said, it’s not rational. Fourth and fifth: Two older college pitchers with previous injury problems, College of Charleston’s Taylor Clarke and Indiana State’s Jeff Degano. Clarke came back from Tommy John to higher velocity (low 90s), the third-best strikeout-to-walk ratio in the country, and, sneakily, one of the top seasons by any pitcher in Division I. I ran into Degano, more or less at random, against Illinois State a few weeks ago. While I was asking myself who the hell Degano was, the redshirt junior from British Columbia was slidering Illinois State to death, allowing only one hit and no walks against five strikeouts in five innings. There are a bunch of reasons, from age to athleticism to injury history, not to take Degano, but early on Day 2, someone’s going to ignore them and snap him up.